Officer Virgil Messmore and his K9 partner, Daisy. Photo by Luis Garcia. To enhance the California State University, Northridge Department of Police Services’ strong relationship with the community, officers began this week using body-worn cameras when in the field. Using body-worn cameras is just the latest example of CSUN police efforts to strengthen its relationship with and service to the campus community. Glavin was recently recognized by the Anti-Defamation League for the department’s training requirements, which are designed to ensure cultural sensitivity and protection against hate crimes on campus. The department also conducted additional training with the Anti-Defamation League on ways to be more sensitive and inclusive. The training and other department policies help nurture an environment to help victims of hate crimes feel comfortable in reporting them to police. The police department has also worked to educate the community on safety tips for emergency situations. In 2016, the CSUN police department collaborated with the Department of Cinema and Television Arts to create a video to train students, faculty and staff how to react in an active shooter demonstration. The video, which has been shown in classrooms and in orientations, can be viewed at www.csun.edu/police/activeshooter. Public safety will be further increased when the department’s K9 unit is back to full strength. Last year’s recruit, Daisy, 2, a yellow English and American Labrador who is trained in explosives detection, will soon be joined by Tank, a 17-month-old black Labrador. Tank is approximately halfway through seven-week training for a specialized type of explosives detection called Vapor Wake. Unlike the traditional explosives detection method which focuses on static objects, Tank will be able to sniff out persons with suspicious substances moving throughout a large crowd. Daisy, who works with officer Virgil Messmore, and Tank, who will work with officer Nicholas Canady, will be used for protective sweeps at events and other detection activities. 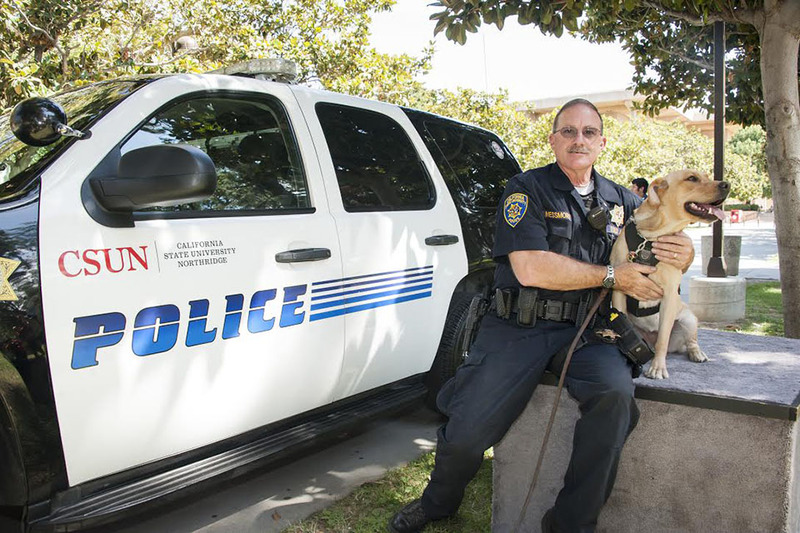 The police department will continue to take steps to strengthen its positive relationship with the CSUN community, Glavin said.